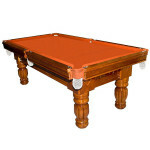 Pool tables available at Mr Billiards are high quality, commercially built units that will provide years of playing enjoyment. You can simply choose a model and have it delivered to your home or place of business. For the very ambitious woodworker, there is another option:building one yourself. Before you embark on such a grand task, make sure you are aware of what is involved. 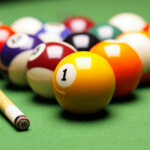 Here, we provide a brief summary on building a functional pool table, but keep in mind things have been simplified, and the quality of the materials and standard of finish is inferior to a Mr Billiards pool table that has been produced using commercial machinery and buying power. Before you do any building you need to know where the table will be located. 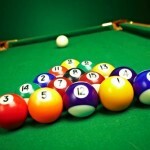 Pool tables need approximately 4 feet of room available on each side to allow for unimpeded play. A standard pool table is approximately 7 foot by 3 ½ foot so you will need a room big enough to house a table of this size. Once you have your room measurements building can start. Slate is the preferred material for the flat playing surface but for this project we will use wood. Cut your flat piece of wood to your desired dimensions, ensuring the edges are perfectly straight and the surface, perfectly flat. Sand the edges. Using a scroll saw,cut 5 inch diameter pockets out of the corners and at the half way point of the long edges. Again, sand all edges. The table legs should be made from minimum 6 inch by 6 inch wooden beams. Optionally,they can be lathed or left square. 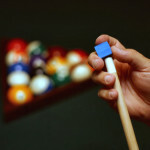 They must be cut to exactly the same length,keeping in mind that a standard pool table is approximately 3 feet tall.Position the legs on the floor just inside where each corner pocket will be located. Screw the table top into place and secure with L shaped brackets on the underside of the table. Next,measure and cut the wooden rails. Mark and remove spaces for the pockets and then secure the ledges with screws every 12 inches. The styling and finish of the ledges is up to you but a routed outside edge adds a simple but stylish finish.We encourage you to view other tables to find the style you prefer. Spray the flat playing surface and inside edge of the rails with adhesive. Take your felt and carefully roll it over the playing surface leaving extra felt hanging over the rails. Move along the felt removing any kinks or air bubbles. A rolling pin is a great low tech solution here. Once the felt is in place staple the outside edges and trim the excess. Finally,screw your nets in place, allowing enough room for at least 4 balls in each pocket, and go over the entire table with a level and adjust the legs as necessary. You now have a functional table. The addition of an underside cabinet, cushions, brass fittings and further finishing is entirely up to you. 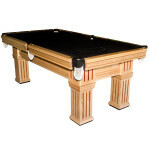 Pool tables built as described above are more of a woodworking project than anything else. 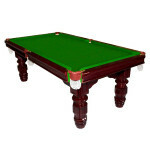 For pool tables that will be frequently used, we recommend commercially built models, using high quality materials, such as those available at Mr Billiards.